It's Wednesday, and that means it's time for a new challenge over at The House That Stamps Built. 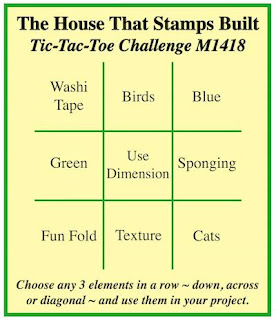 Today it's another fun Tic Tac Toe board.....Choose three items (across, down, or diagonally) to include on your creation, then come by the blog and link it up! I chose to go with: Birds -- Use Dimension -- Texture, and I'm featuring the beautiful Repeat Impressions stamp 1704-P, Great Blue Heron. After stamping my image on watercolor paper, I colored it with Prismacolor pencils and inked the edges with walnut stain distress oxide. I then popped it up off my background using foam mounting tape. The corrugated cardboard is wrapped with natural colored burlap string and layered on a polka dot background with a diamond border peeking out the top. 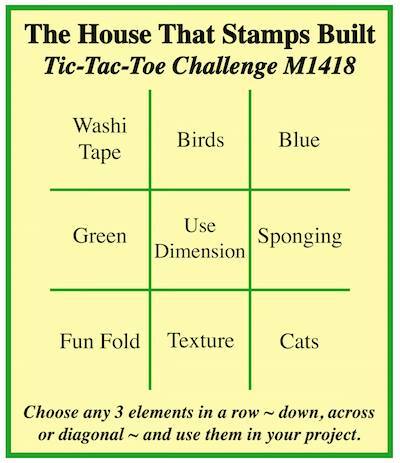 Awesome job with this beautiful blue heron - love your take on the tic-tac-toe this month. This is stunning, great coloring and like the corrugated cardboard - great touch! Terrific coloring of the image and love the texture you chose to go with it! I love GB Herons. A friend of mine just visited the Galapagos Islands and said they are everywhere there! Anyway, beautiful coloring and expert layering. Thanks for including SOS in your sharing! Beautiful!! That cardboard looks awesome behind this fabulous image! Love this beautiful Heron image and your fabulous layers truly bring it to life. Beautiful coloring and the background DP and texture are fabulous! I love the fence effect you've created with the punch, corrugated cardboard, and twine! It really sets off your image! Thank you for joining us at the Heartful Stamping Challenge!